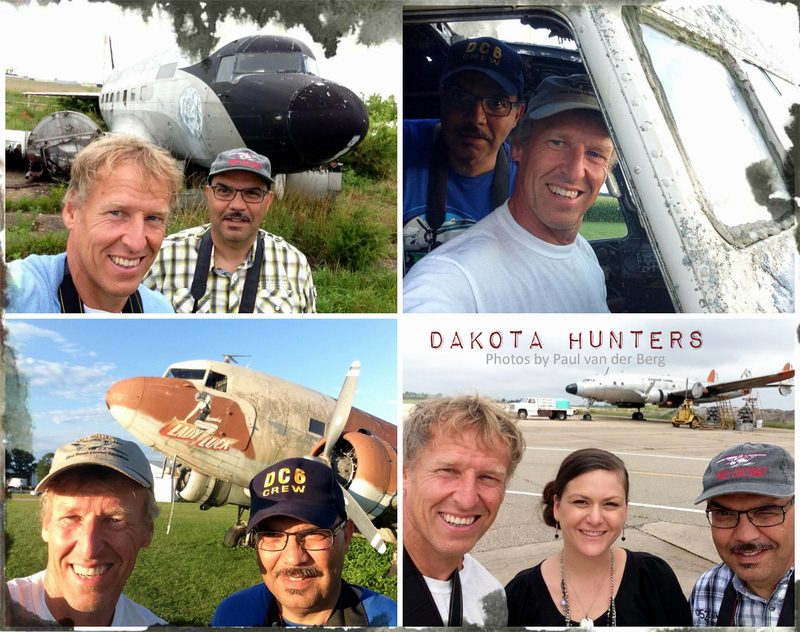 My self and Dutch aviation photographer Paul van der Berg, decided to combine a USA mid-west road trip, with a stopover at the much publicized 'Warbirds & Legends Gathering' at Topeka – Forbes Field in Kansas. This event listed at least 20 Douglas DC-3/C47s to show up! After a smooth transatlantic flight we arrived at Chicago O-Hare International airport. It was surprisingly cool as we left the terminal building as we collected our mini SUV. Soon after, we got underway heading out into the Chicago suburbs. After passing our first toll booth we headed out on Highway 80 West, but not for long. After about a 40 minute we turned South on the I-57 towards the Chanute Air Museum located near Rantoul. To fatigue to press on we decided to stop at a small town called Morris and spend our first night at the local Comfort Inn. 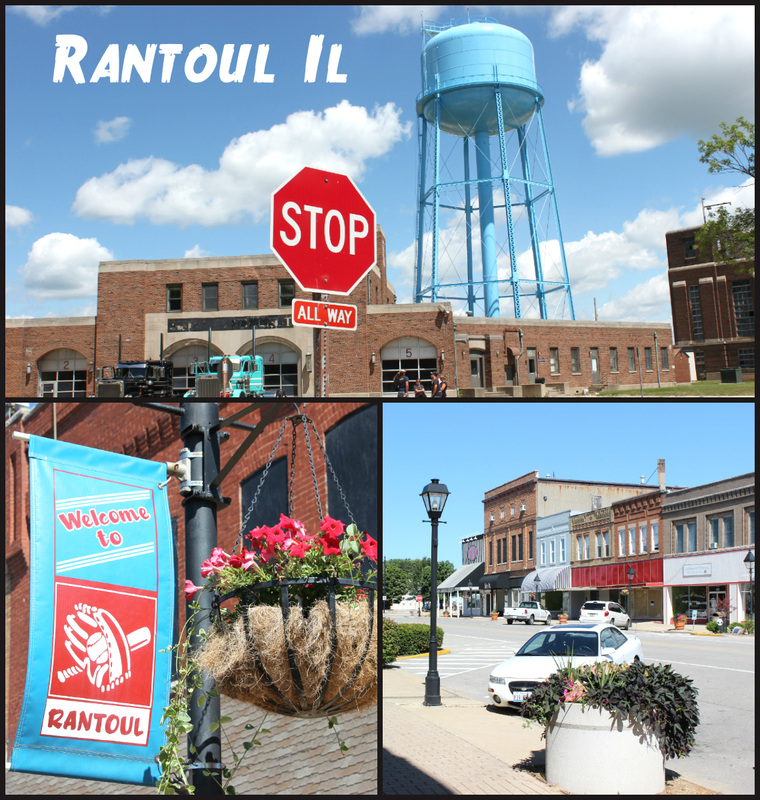 The following morning started cool and sunny and we headed straight for Rantoul. 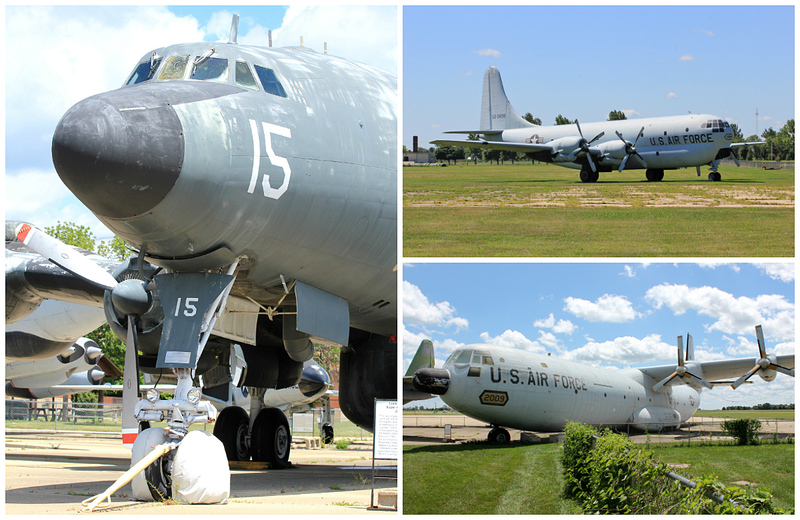 The Chanute Air Museum opens at noon and its dedicated to collect, preserve, and exhibit aerospace artifacts. Special emphasis is directed to the life and accomplishments of the former Chanute Air Force Base. For me all of the interesting stuff is located outside on the ramp. As you drive out to the museum one is greeted by a lone Boeing C-79G Stratocruiser out in the field. The crowded ramp is filled with former USAF fighter jets, but I was more drawn to the big stuff, such as a Lockheed C-130 Hercules, Grumman Hu-16B Albatross, Douglas C-47D Skytrain, Lockheed WV-2/EC-121K Warnings Star and a Douglas C-133A Cargo-master. The Warning Star was looking extremely worn-out and needs a new coat of dark Navy paint. After 2 hours we decided to leave the museum and head out South West towards St Louis. Following Highway 72 West and Highway 55 South we reached St Louis in about 5 hours. We crossed over the Mississippi River and had a grand view of St Louis famous landmark; 'the Gateway Arch'. Passing the city we entered a new state: Missouri. We decided to stop near the small town of Sullivan and spend the night at a local Super8 motel. The following morning the weather turned cool and grey. 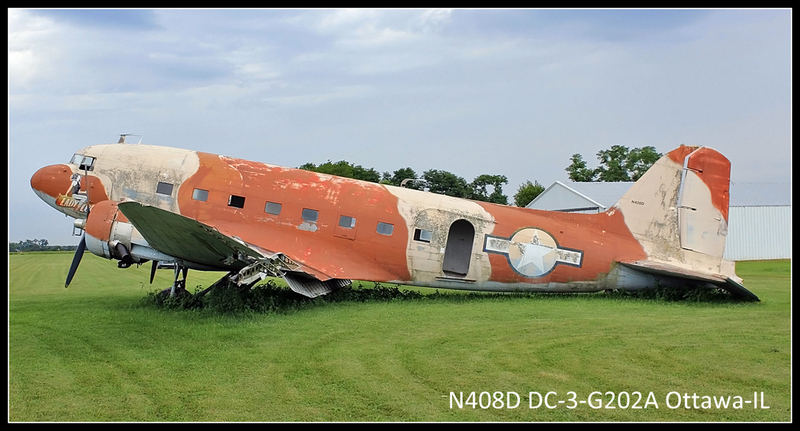 After a simple continental breakfast, consisting of toasted Bagels, cornflakes and coffee, we headed out for Vichy (Rolla), to visit a DC-3 graveyard. Rolla National Airport is a former U.S. Army airfield located on US Highway 63 in Maries County. It is a home base off several single and multi-engine planes, and serves as an important transportation hub for many large local businesses and government organizations. Currently Baron Aviation Services Inc operates a small package express cargo service on behalf of FedEx Express from Rolla. None of its current Cessna 208 Caravan's can be seen here, only it operational control center. Baron started back in 1973 operating a fleet of cargo DC-3s. Its first operational cargo flight was in October 1975 with DC-3 freighter N6CA. After the DC-3 was taken out of service, four a/c (N51938-N47FJ- N1350A and N19721) were parked along a disused runway for future onwards sale. Then in 2008 a tornado struck the airport and damaged all 4 DC-3s. The poor Dakota's have lingered on ever since. I have seen some of Dodson turbine DC-3s on a previous trip, when I visited the Wonderboom facility, in South Africa, back in February 2004. During our visit two turbine DC-3s (ZS-OJJ and N81907) and piston engine N211GB where seen outside in stored condition. Inside the small hanger turbine DC-3 ZS-OJM was ready to be delivered. I asked Mr. Robert Dodson where this a/c was going, but he declined to give me an answer. After our pleasant visit we where granted a tour of Dodson International Parts and Storage yard….just a couple of miles to the East. This is the place where Dodson International has collected 5 million a/c parts for over 30 years for all types of small aircraft types. The storage area is huge, but we where interested in the DC-3 storage area. 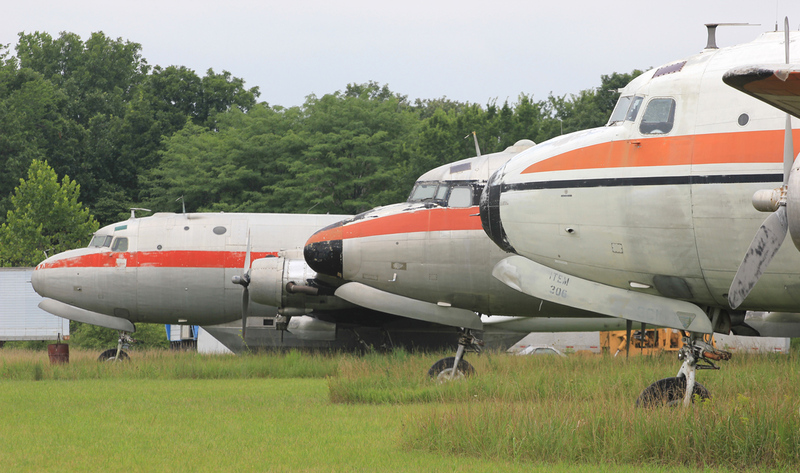 Dodson keeps several containers of DC-3 parts in a back lot. Since a few years it also keeps the fuselage and wings of turbine DC-3 N834TP which was involved in a take-off incident at Mohave Desert. This DC-3 was converted into a turbine conversion and highly modified with a belly radar pod and chin FLIR turret. It was formerly operated by the South African Air Force as a maritime patrol aircraft. Across the road from Dodson International and you cannot miss it, is the stored Bill Dempsey's ex Central Air Services Douglas DC-4/C-54 (ex air-tanker) fleet (N67061, N96454 and N816D). 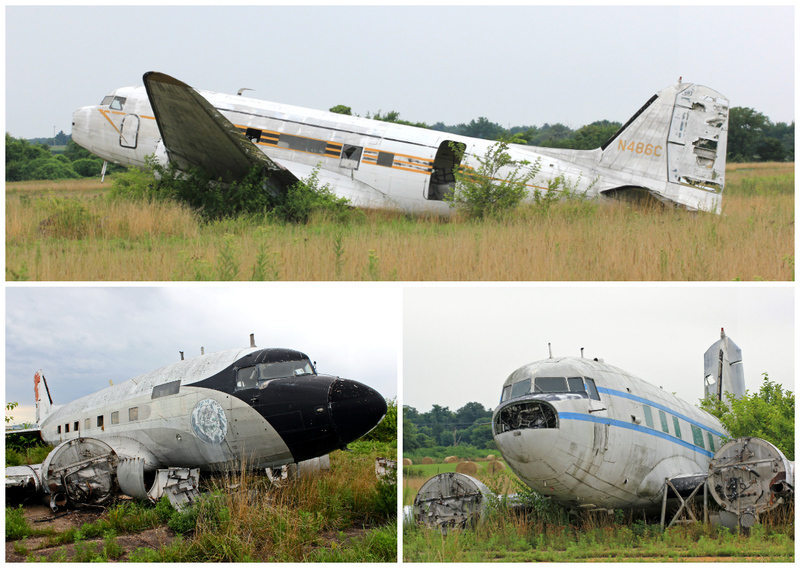 They are parked on the Dempsey's Farm airstrip and also include a lone Lockheed-18 N555H Lodestar, Convair C-131B N43941 and an unmarked bare metal Douglas DC-3 (N37737). The grass strip was deserted and it appears that nobody was home, so we took our pictures and headed out again. 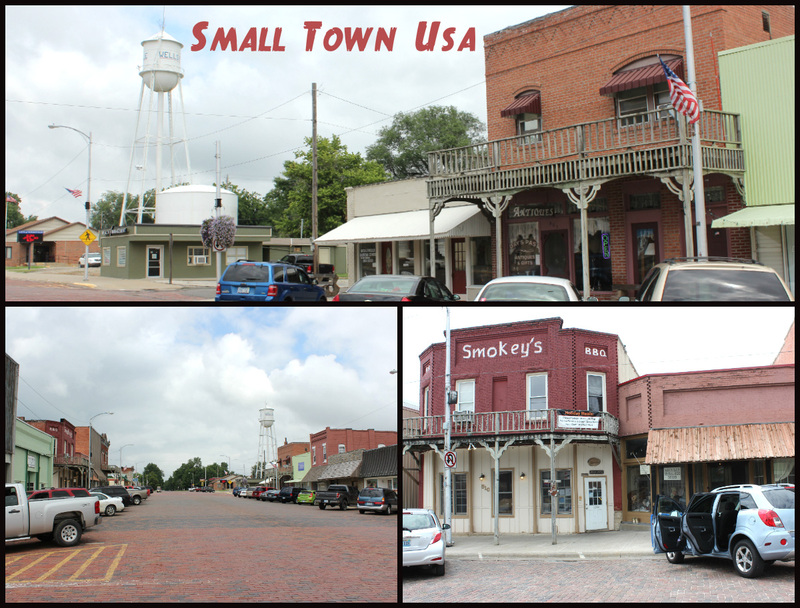 After a tuna fish sandwich and corona beer lunch at a local BBQ restaurant at Wellsville we headed North on Highway 35 bound for downtown Kansas City. 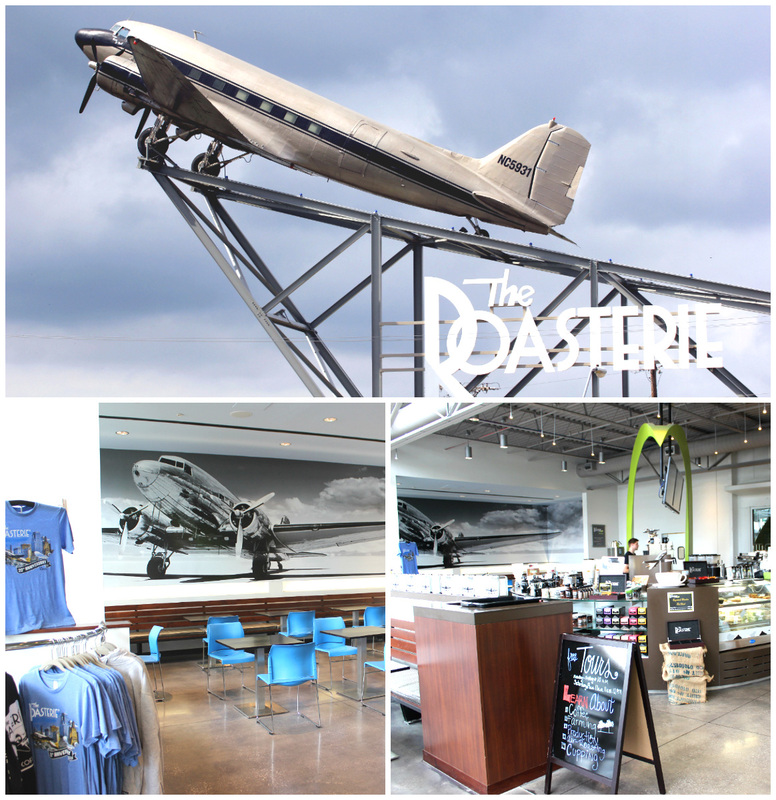 We decided to have some afternoon coffee at the DC-3 Roasterie just south of the Municipal airport. The owner of the Roasterie is an airplane enthusiast and recently purchased an ex Lee High Acres mosquito sprayer out of Florida (N838M) to display at his new coffee shop and coffee factory. The DC-3 is displayed high up on a steel structure, which in my opinion is not very attractive. However the inside of the stylised Art-deco coffee shop is very refreshing and serves excellent hot air-roasted coffee in different blends and tastes. 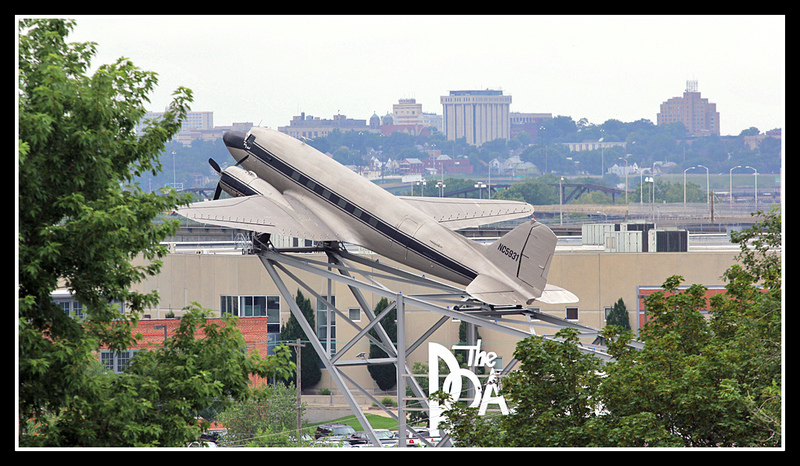 Not long after we jumped into our SUV again and drove through downtown Kansas City and crossed over the Missouri River for our next stop at the Airline History Museum, which is located at the downtown airport at Lou Holland Drive. This was a Tuesday and the Museum is normally closed, but I was told that typically some of the mechanic's were working on the planes and we could knock on the door. Driving up to the main old AHM hangar we noticed that the main hanger doors where still open so we decided to drop in. I have been to Kansas City before, back in 2000, when I got invited to fly onboard the museum Lockheed L-1049H Constellation N6937C. At the time they where known as 'Save-A-Connie'. We met up with Mr John Roper, who's I contacted a couple of weeks before prior to our trip. 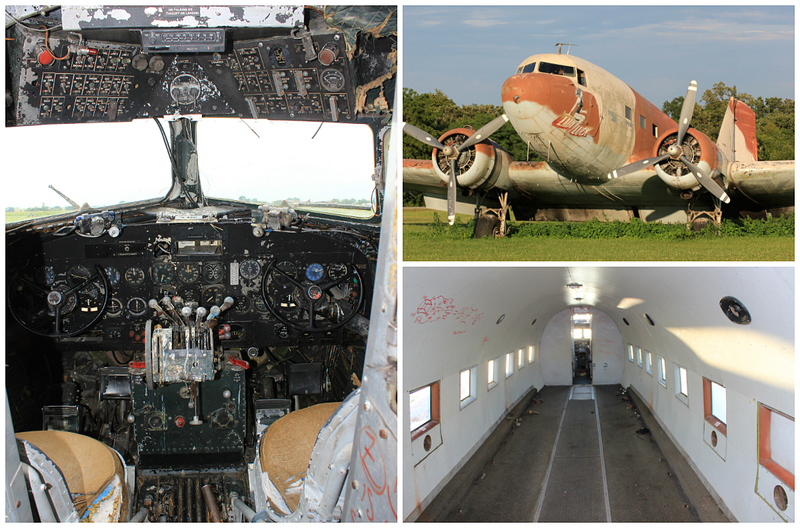 I was eager to see the AHM TWA Douglas DC-3 (NC1945) which was in its final stage of restoration to flight! 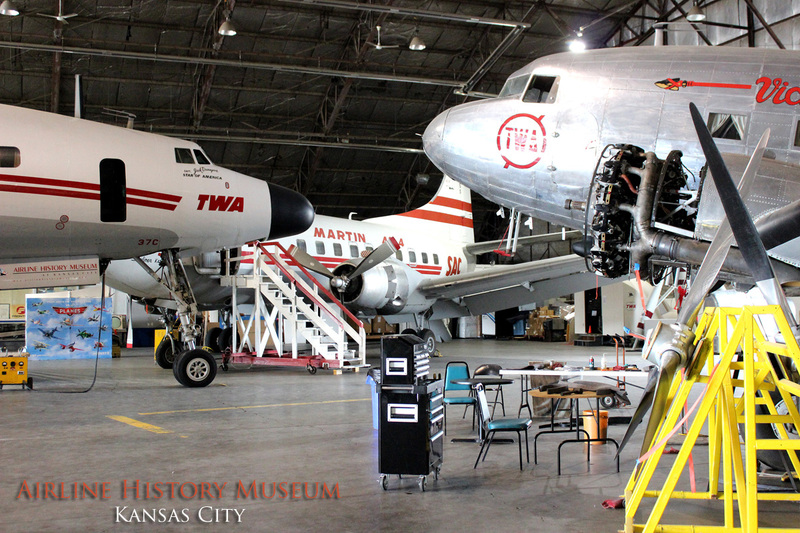 The AHM was gearing up for a big event in the fall In order to promote the DC-3 and Constellation. AHM wants to get both a/c ready for flight in 2014. The Martin 404 (N145S) is also being considered to undergo a full restoration to airworthy condition in the next year. 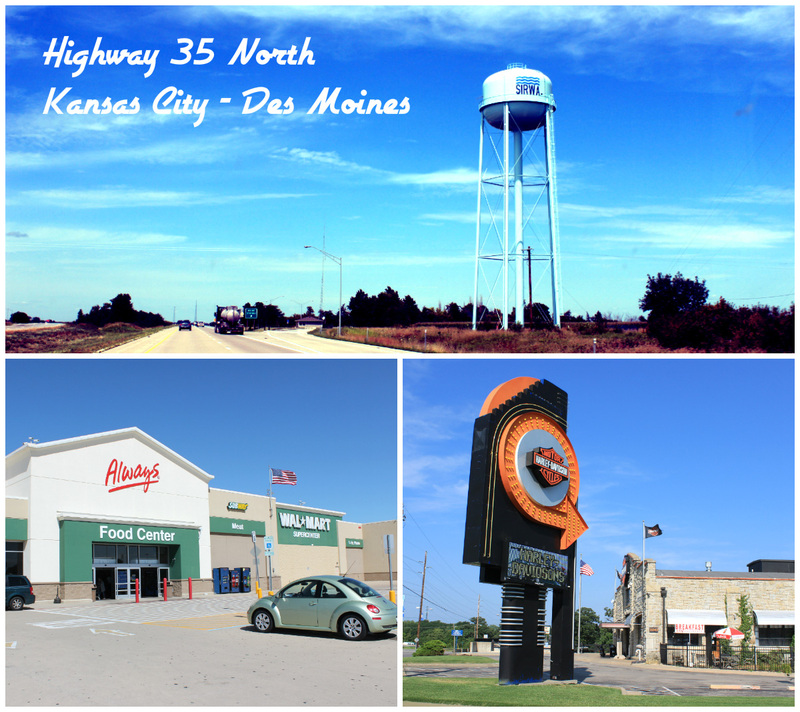 After a short but sweet photo-shoot it was time to leave Kansas City and head out West again along highway 24. 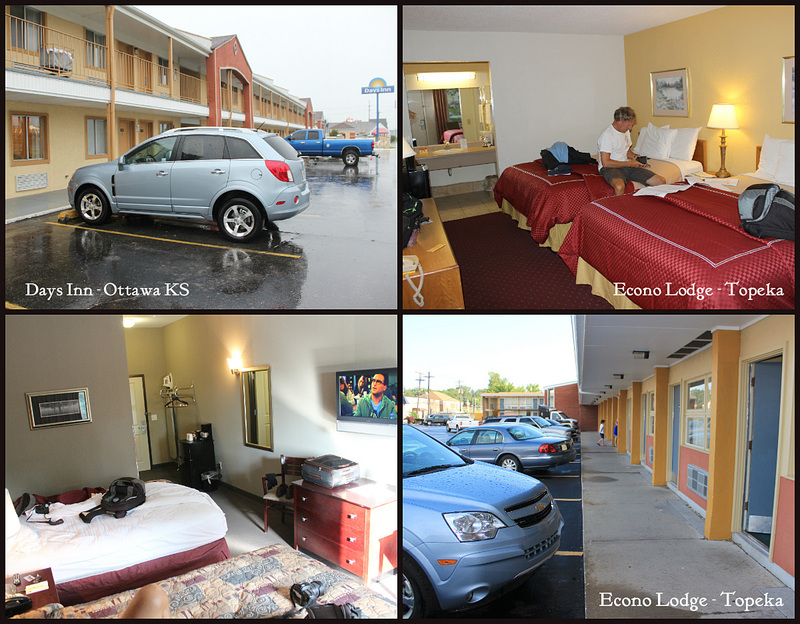 It was a hectic day with lots of driving and new impressions and we finally ended up at Bonner Springs Super 8 motel …for some dinner and cool beer! The following day was an early rise and we decided to by-pass Topeka for our final push to the West and go for Salina Municipal Airport, home of Gordon Cole Lockheed WV-2 Connie. It took us about 4 hours to reach Salina and we immediately spotted the Connie 3 tail fins. The Salina Municipal airport is a vast place and used to be the Smoky Hill Air Force Base. Upon completion prior to WWII, this base was home to 45 B-29's and 20 tanker planes of the 301st Bombardment Wing. In 1957 the base was renamed again, this time to Schilling Air Force Base and was home to Strategic Air Command bomber with the B-47s. Currently not much was happening and it proved impossible to photograph the Connie from the fence, so we decided to check in with the airport authority. We met up with the friendly Melissa McCoy, Manager of Public Affairs and Communications and she was delighted to see us two European photographers on a mission. Not much later we joined her in her airport Van and drove towards the forgotten Starship Connie N1206. 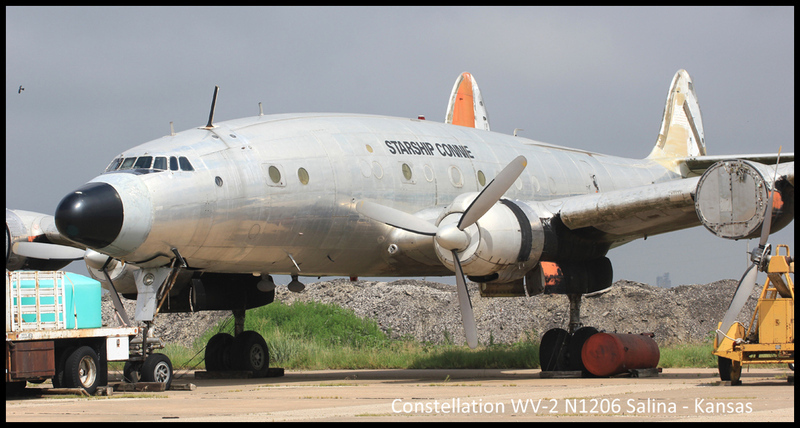 She's not looking too airworthy at the moment and nobody seems to know what the future will bring for this rare Constellation. Number #1 engine was missing from this rare ex USN/FAA Lockheed WV-2 Constellation. Let's hope the owner will get her in the air again or get her a new home in the near future! 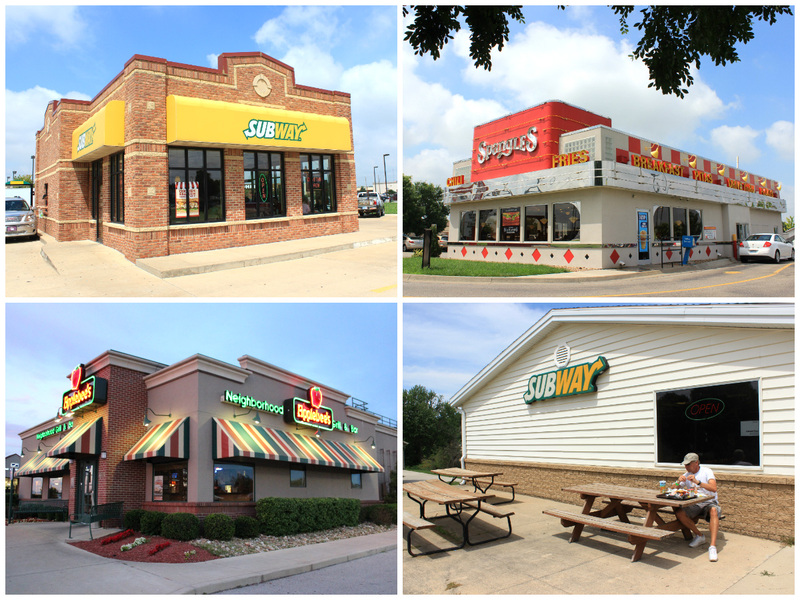 After a quick lunch in town, at our favorite Subway's restaurant, it was to get on the road for our final destination. Around sunset we reached Topeka and drove up to our Econo Lodge on Topeka Boulevard. This would be our home for the next couple of days while visiting the 'Warbirds & Legends Gathering*'. 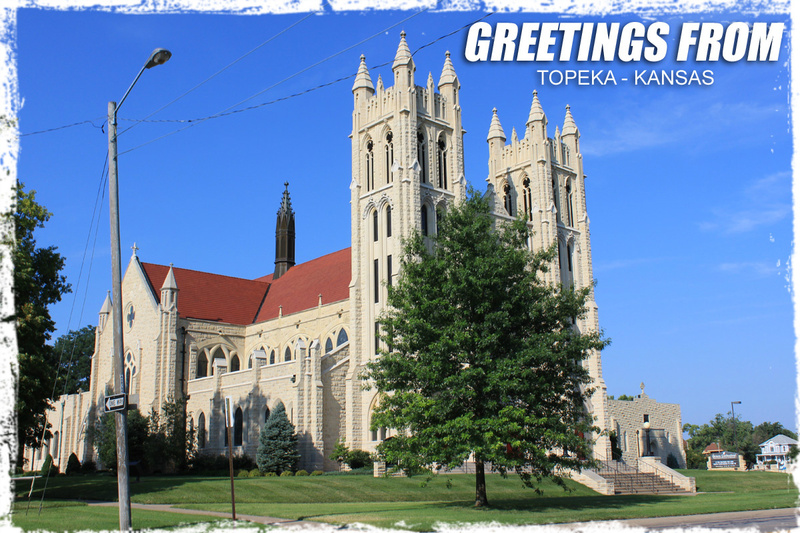 Known as the capital city of Kansas, Topeka, it is in the center of the United States and the heart of the Midwest. Here you'll find the best in Midwestern hospitality coupled with a vibrant atmosphere of a city on the rise. 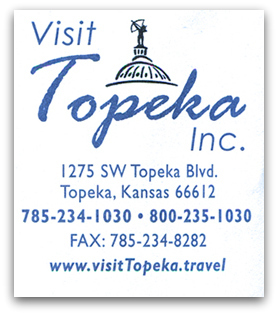 If you have aviation in mind, Topeka is an excellent place to visit. 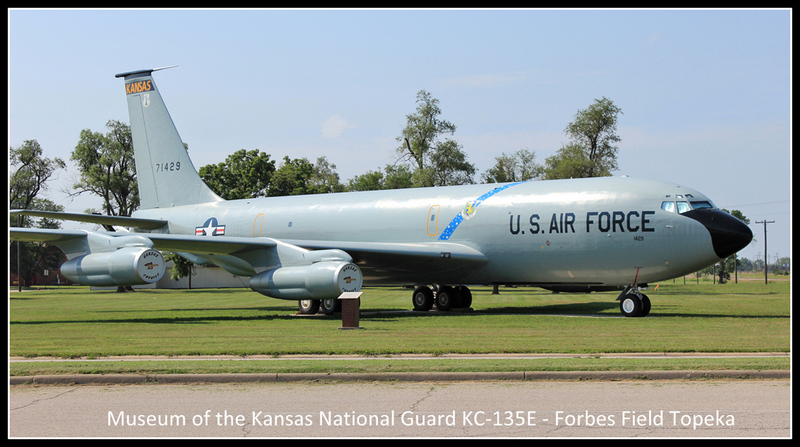 The 190th Air Refueling wing of the United States Air Force, which is an aerial refueling unit, operating the KC-135R tanker, is based at Forbes Field Topeka. (Base tours are available). 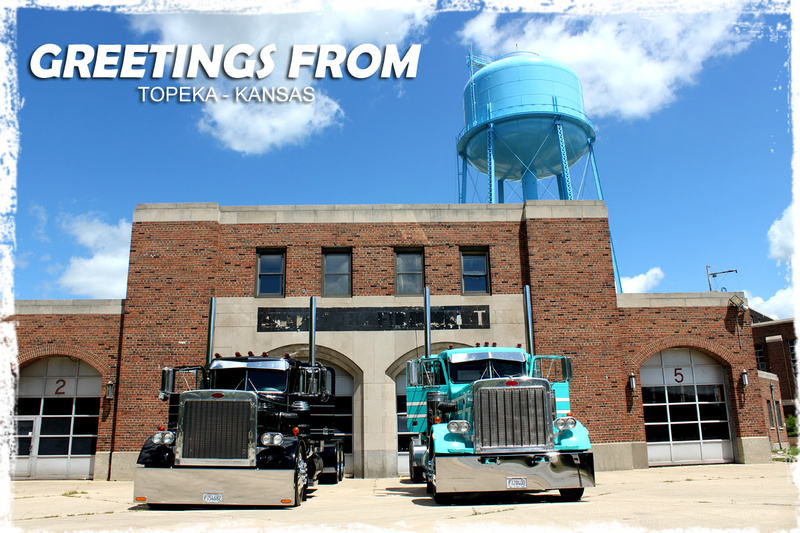 As you enter the airport entrance road you can make a quick stop at the Kansas National Guard Museum which is free. Around the grounds are several military trucks and tanks on display, including an EB-57 Canberra, F-105 Thunderchief, F-4D Phantom. For me the KC-135E Air refueling tanker was the catch of the day. Also located at Forbes Field is the Combat Air Museum, which is home to a wide variety of military aviation memorabilia, housed in two former Air Force hangars. Its collection spans from WWI period to present day, including aircraft engines, flight training simulators, and a military aviation art gallery. Due to our hectic schedule I was only able to photograph the outside static exhibitions. Of interest for me were the Douglas C-47D Skytrain and the huge Lockheed EC-121T Warning Star.